Lumen Legal has published a collection of Legal Trend predictions for 2014. 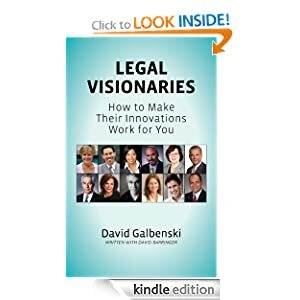 There are insights from Lumen Legal founder David Galbenski, and noted enterprise legal industry leaders Edwin Reeser and Jeffrey Carr. A special tip of the cap to David for including yours truly. If you’d like to learn more from him, check out his latest book on Amazon; it is available as a complementary Kindle download today and tomorrow. It’s a great book; I bought it at full retail in hard copy when published. No batteries required and the 27 bright lawyers David interviews really light up the pages. The subject of discounts holds perennial interest for enterprise lawyers. The best advisors tell leading law firms to avoid making fee discounts a strategy, and acknowledge that it often masks issues that run much deeper. A reduction made from the gross amount or value of something: as from a regular or list price. Really? For every matter you work on? For all 1,000+ lawyers? To leave out of account: disregard; to minimize the importance of. Outside counsel and In-house counsel approach this sense of discounting from different perspectives. Today a look at outside counsel; in a few days, I’ll return the favor to in-house counsel. 1. Managing Partners: They can discount how much pressure competition is placing on firm clients, and how this affects the procurement of legal services. Some partners with key client relationships tell me that the response they get from managing partners or firm CFOs on discounts (yes those discounts) or AFAs is “We’re better, sell harder. I did.” Perhaps, maybe ten plus years ago, which in the dog years that frame legal change is more like 30. 2. Key Client Partners. This group is the point of the spear in enterprise legal these days. They find the clients and mind the clients. Some may be discount the reality that most GCs can get service X from firm Y or Z (and soon many others). They can also discount the fact that some services that experienced monthly demand may become more episodic. GCs who pay top dollar for all services all the time are known as “ex-GCs” in the industry. 3. Subject-Matter Expert Partners. These partners used to be seen as the real core of larger law firms. Their value was forged in a crucible that mixed the ore of high-end knowledge with the heat of consistent deals, cases or controversies. Alas, what this group sometimes discounts is the fact that when you are seen as a mile deep and an inch wide, it doesn’t take much to knock you out of the game. 4. Hail-Fellow, Well-Met Associates. They are hoping to get to (3) soon, and maybe (2) someday. Or land a gig in-house. There is a lot of virtual ink spilled on the plight of law students these days, and what the future means for them. It’s fair to look closer at law firm associates, since the firm probably doesn’t need more of those in group (3) generally, and jumping the shark to group (2) directly is really hard early in a career. Group (3) can hoard work and not want to train “cheaper rivals;” group (2) wants to grant them some client contact, but will be in hot water with group (1) if anything goes wrong. So the take-away is this: before you look at a discount in terms of price, consider what you yourself may be discounting in terms of your honest view of the enterprise legal market today. Where do you fit in? Where is your firm or practice specialty headed? What are your competitors doing? (If you think you don’t have competition, it’s OK, but only if your name is Martin Lipton). Price discounts are a lagging indicator of many decisions that happened much earlier. Next time, a look at what in-house counsel are discounting, and how this factors into what law firms are (or should be) doing. * NB on Apple: Yes Apple doesn’t discount its latest products and premium prices them to boot. But buried in the latest earnings release was information that Apple’s most supply-constrained product was the two-plus years old iPhone 4. It’s “free” on a two year contract. So a message to all big-time law firms that think discounts are for lesser legal lights: sure, don’t discount. Just be really really confident that your service design and delivery is better than Apple is with its products. And even if you are, somewhere there is a looming Samsung to your Apple. Today rounds out three predictions for 2013. The first was the importance of The Team, and the second the reality of keeping The Score. Today, though, I am referring to practice not like that, but more like what a team does that wants to score better and win. Is it possible though, from where he is coming from that, with practice, not you would be better, but your teammates would be better? How the hell can I make teammates better by practicing? I’m not saying that some superstar lawyers agree with Mr. Iverson, but at least he is a refreshingly honest person, who could not hew the company line if he tried. We are entering an era when even superstar lawyers need a team. And to score well together requires some practice at key skills. New technology (for project management or collaboration, for example) can’t easily take hold because people don’t know how to (or don’t want to) work together. In fact, I think many lawyers today think that technology is more often the problem, not the solution. I know that “practice” is a hard concept to explain without it degrading into visions of firewalks and rope ladders and teams of people zip-lining over crocodile-infested waters. I will offer some examples of what to practice early in the new year. For now, I think 2013 will show us that when a well-selected small group (a team) uses a few key metrics (the score) and takes seriously the importance of working together well (the practice), they are more likely to best the competition than those who continue with the status quo. And they just might have a bit of fun in the process. Here’s to more fun in the new year. Number two in this hit parade is “The Score.” As in lawyers working in the enterprise space (inside or outside) need to know that some things count and other things are just part of the process in getting there. It used to be easy for outside counsel to keep score. They counted hours, and regaled peers about going beyond 2,000 hours posted and paid in a calendar year. In-house counsel also kept score years ago. They typically regaled their former peers in firms about how they did not count hours. Now in-house counsel need to keep score about how their corporate legal function drives top line revenue, removes costs to bolster bottom line earnings and controls risk so shareholders see gains (and keep them). It’s harder for outside counsel to keep score now, since they are being pressed by those same in-house counsel to lower costs. Billing higher rates by the hour is a luxury for a few law firms, not a strategy for the rest. Part of keeping score in 2013 will require an understanding that if something isn’t a “business issue” then it probably shouldn’t be worked on by corporate counsel in the first place. Pursuing legal questions for the law’s sake is great. It’s just not part of the corporate landscape any more (if it ever was). I think in 2013 many in-house counsel will move past that bromide. They will be part of growing the enterprise, which will involve handling more work with existing staff. The “less,” if at all, may refer to fewer outside law firms, charging lower unit costs. And getting better results along the way. That’s how we keep score today. This is the time of year for predictions. Last year I put forward seven (State of Legal 2012: 1, 2, 3, 4, 5, 6 and 7). I was tempted to just pick three and update. What I mean is that for all the talk of cost control, collaboration, teamwork, project management or social media “connecting,” nothing gets done unless someone does something. Each of those laudable concepts or techniques can get bogged down by the fact that often everyone is expecting someone else to take ownership and initiate action. As change in the enterprise legal industry continues at its glacial pace, I find myself less interested in large organizations and more interested in the small teams inside that can actually do something. How big of a team, you ask? Well, Amazon founder Jeff Bezos observes the “two pizza rule.” To encourage innovation and limit groupthink, he holds that if a team can’t be fed with two pizzas at a lunch meeting, it’s too big. (The team, not the pizzas). Does that mean five? Probably not many more than that. If you have the brawny lad from IT onboard, it may be four. In the legal sphere, we see this when an excellent small team in a lawsuit can prevail over a larger, if more diffused, group. We also see this in the sometimes metaphysical realm know as “collaboration.” My working definition: where many are “on” but few are “in.” Like when many are on a conference call, but few are in on key decisions, and almost no one is all in: staking one’s reputation on getting a result. That last person is called a project manager, or, more generally, a leader. Change in the law only happens when a small group of well-selected lawyers does something important in a better way. This is a sobering fact for large law firms and big corporate legal departments: there used to be strength in numbers. Now there can be inertia in that historical critical mass. But when they leverage their people properly, watch out. If you have ever been on a small team that worked well and got good stuff done, you are lucky. You know how rare it is and much it makes you look forward to going to work. So I hope in 2013 you are part of such a team. And that you don’t take the last slice of pizza.